For six performances in April 2019, Bozeman Actors Theatre transformed the Story Mansion into 1990s Greenwich Village with its staging of Diana Son’s touching love story, Stop Kiss. Tonya Andrews directed an all-star cast of Torie Laher, Claire McGinty, Mark Kuntz, Gabe Taurman, Sasha Kostyrko, and Colter Langan. Kimberly Eyre was stage manager and Jonathan Dove was lighting and sound designer. Gordon Carpenter served as technical director, with assistance from Tor Gilbertson. Production assistants were Sara Lundeen, Angela Cateora, Landon Elder, and Sara Stanek. Our producers were Gordon Carpenter and Katie Gilbertson. VIDEO BY CARL HANSEN. COPYRIGHT © 2019 BOZEMAN ACTORS THEATRE. ALL RIGHTS RESERVED. For six performances in February-March 2019 in the Crawford Theater at the Emerson Center for the Arts & Culture, Bozeman Actors Theatre staged one of the signature achievements of Eugene O'Neill, winner of the Nobel Prize in Literature and arguably the greatest American playwright of all time. Mark Kuntz directed Kari Doll, Daniel Erickson, Mike Hesford, Colton Swibold, and Colter Langan. Torie Laher served as stage manager. Our lighting designer was Julie Seitel, our sound designer was KC Luchsinger, and our costume designer was Yvonne Siemer. Gordon Carpenter was technical director. James Burroughs was producer and Billie Warford co-producer. Our underwriters for this production were Susan Quarles and Geoffrey Stephens. Audiences raved about the stellar performances in this classic play that only Bozeman Actors Theatre could present to our community! For six performances on November 23, 24, 30 & December 1, 7, 8, 2018, Bozeman Actors Theatre presented Sam Shepard’s one-of-kind musical, Tooth of Crime, at the Eagles Club & Ballroom in downtown Bozeman. Under the direction of Gordon Carpenter, with stage management by Jessica Lee, the play featured Mark Kuntz (Hoss), Tonya Andrews (Crow), Will Dickerson (Meera, Ruido Ran, Doc), Torie Laher (Becky), Sydney Madill (Chaser), and Lee Dickerson (Ref). Alongside the actors on stage, our live band, The Keepers, provided musical accompaniment under the musical direction of Lee Dickerson. Instrumentalists were Ken Bishop (bass guitar), Lee Dickerson (rhythm guitar), Bruce Kriscovich (lead guitar), Josh Poole (drums), and Royce Wilkinson (saxophone). The play’s lighting and sound designer was KC Luchsinger. Our costume designer was Mandy Luchsinger. The play’s producers were Beth Boyson and Lori Rosolowsky. This was a challenging play for cast and audience alike—one that only BAT would bring to our community. A resounding success! Here’s our preview video that intrigued audiences at the start. Video by Carl Hansen. Performance and rehearsal photographs by Dava Guptill Knobel. The play’s costume designer was Stefanie Cytron, with lighting and sound design by Jonathan Dove and scenic design by Angela Cateora and Taylor Davis. Gretchen Minton served as dramaturg, and Tonya Andrews was acting coach for the cast. The play’s producer was Kevin Brustuen. The play featured thoughtful talkback discussions with MSU scholars and the actors following most performances, and a calendar of related events at the Museum and on campus during the month of October kept interest alive even after the play closed. Bozeman Actors Theatre and Verge Theater presented Doug Wright's I Am My Own Wife in six sold-out shows in February 2018. Following a full-capacity preview night at the Verge, this amazing production starring Ryan Lawrence Flynn and directed by Kari Doll was the talk of the town! Over two-and-a-half hours and a mosaic of 35 characters, Ryan's unforgettable performance—and the accompanying technical achievement by lighting designer Julie Seitel and sound designer KC Luchsinger—presented the life of Charlotte von Mahlsdorf, a German preservationist who survived a violent childhood, the Nazis, and a repressive Communist regime as a transgender woman. Set design was by Kari Doll, with costume design by Mandy Luchsinger. Our stage manager was Sara Stanek. The producers were James Burroughs and Kari Doll. "This is the best piece of theater I've seen in Montana, and just maybe the best performance I've seen in my life. BRAVO!" "It's a master class in acting and storytelling. It's a crown jewel. It's Ryan Lawrence Flynn at his finest." "The ending of this play is perfect. And the rest of the play isn’t far behind." "An amazing tour de force. I can’t even imagine how he did it!" Our "Supporting Role" sponsors, The Nova Cafe and The Law Office of Christopher J. Gillette, helped make this production possible. Photographs by Tim Stiller, The Big Event Photography. Bozeman Actors Theatre proudly presented Sam Shepard's Fool for Love in November and December 2017 at the one-and-only Eagles Club in downtown Bozeman. After four capacity-crowd shows, the cast and crew staged an extra show by popular demand! Fool for Love starred Torie Laher, Will Dickerson, Mark Kuntz, and Colter Langan under the direction of Gordon Carpenter. When Sam Shepard passed away earlier in 2017, we lost one of the last great American playwrights of the 20th century, someone whose name deserves to be mentioned in the same breath as any number of other bright stars of the American stage: from Eugene O'Neill to Tennessee Williams to Edward Albee. Bozeman Actors Theatre and our theater-loving community savored this one final goodbye to a literary legend. Bozeman Actors Theatre presented Copenhagen at MSU's Black Box Theater on October 13, 14, 20, and 21, 2017. Considered “an electrifying work of art” by The New York Times, Copenhagen deals with a historic meeting between two prominent physicists responsible for the dawning of the “atomic age.” Themes of politics, morality, and the human side of scientific discovery make Copenhagen a compelling evening at the theater, and BAT audiences agreed! Our production was directed by Dan Erickson and featured Gordon Carpenter as Niels Bohr, Mark Kuntz as Werner Heisenberg, and Tonya Andrews as Margrethe Bohr. Bozeman Actors Theatre, in cooperation with the Verge Theater, presented Montana’s first fully staged production of Marjorie Prime in February and March of 2017. The critically acclaimed play by Jordan Harrison had completed its successful run Off Broadway in 2015 and was a finalist for that year’s Pulitzer Prize for Drama. Our production was directed by Tonya Andrews and starred Dee Dee Van Zyl, Ryan Lawrence Flynn, Cara Wilder, and Gordon Carpenter. Set in the unspecified but oddly familiar future, the story takes place in the household of an average middle-aged couple, Tess and Jon, played by Wilder and Carpenter, who share their home with Tess’s 85-year-old mother, Marjorie (Van Zyl). Also present is Walter (Flynn), a thirtysomething holographic representation, or “prime,” of Marjorie’s late husband, programmed to collect and sort Marjorie’s fading memories. 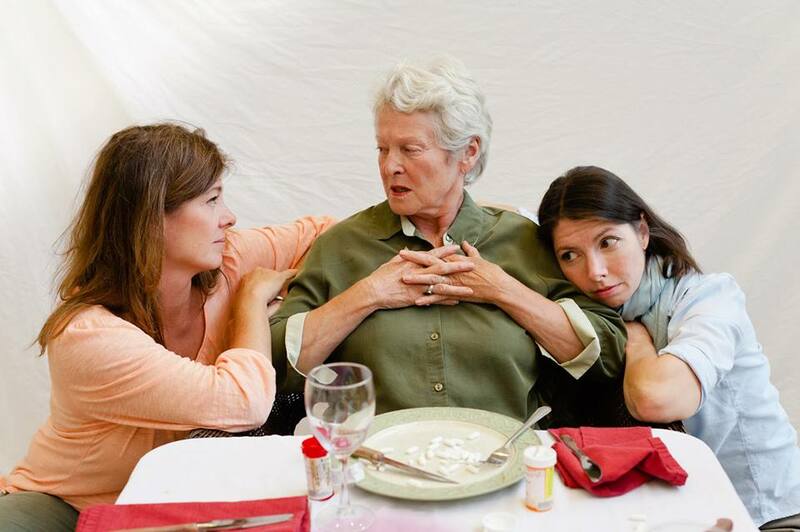 With gentle humor and subtle yet poignant insight, the play confronts issues of aging, death, memory loss and identity. Gordon Carpenter and Cara Wilder in Marjorie Prime. In a first-time collaboration between Bozeman Actors Theatre and the MSU Department of English, BAT presented a staged reading of Edward Albee's Who's Afraid of Virginia Woolf? on November 4-5, 2016, at MSU's Black Box Theatre. Over the course of three acts, the marriage of a middle-aged couple, Martha and George, disintegrates in front of their late-night guests, Nick and Honey, a young couple they have met earlier in the evening at a college faculty party. Each couple faces painful truths, and no one emerges unscathed. In our acclaimed production, Cara Wilder and Gordon Carpenter read the roles of Martha and George, while Steven Harris-Weiel and Susan Miller read Nick and Honey. Dee Dee Van Zyl directed. Who's Afraid of Virginia Woolf? won the Tony Award in 1963 for Best Play and has been revived on Broadway three times, most recently in 2012 with Tracy Letts and Amy Morton as George and Martha. The story may be best remembered from the 1966 film adaptation starring Richard Burton and Elizabeth Taylor. In Fall 2016, the play figured prominently in a modern drama class taught at Montana State University by Dr. Gretchen Minton, professor of English. The staged reading helped students and the public experience the power of Albee's words more than 50 years after the play's Broadway premiere. Bozeman Actors Theatre presented a staged reading of David Lindsay-Abaire’s Good People on July 17 and 18, 2016, at the Verge Theater. Winner of the New York Drama Critics’ Circle Award for Best Play of the 2011 Season, Good People blends incisively drawn characters, humor, and deeply relatable issues of income inequality and racism. Set in blue collar “Southie” Boston, the play tells the story of Margie Walsh, a single mom living paycheck to paycheck, and her long-lost flame who’s worked his way out of the neighborhood. With his signature humorous glow, Lindsay-Abaire explores the struggles, shifting loyalties, and unshakeable hopes that come with having next to nothing in America. Our wonderful cast members for this production were Ben Anderson, Rayna Cozzens, Kari Doll, Daniel Erickson, Dee Dee Van Zyl, and Cara Wilder, with additional lines by Carson Taylor and James Burroughs. Bozeman Actors Theatre presented staged readings of Will Eno's award-winning comedy-drama Middletown on January 21, 2016, at the Verge Theater in Bozeman, and on January 22, 2016, at the Shane Center for the Performing Arts in Livingston. The critically acclaimed Middletown is a deeply moving and funny play exploring the universe of a small American town. The lives of the inhabitants of Middletown intersect in strange and poignant ways in a journey that takes them from the local library to outer space and all points in between. Often described as a modern-day Our Town, the play offers up an old-fashioned version of small-town life that is familiar but with a tilt to the surreal. The cast of our production of Middletown featured Tonya Andrews, Claire Barley, Gordon Carpenter, Maya Dickerson, Kari Doll, Richard Dunbar, Ryan Lawrence Flynn, Emily Jones, Colter Langan, Mark Richard, Dee Dee Van Zyl, Steven Harris-Weiel, and Cara Wilder. Colter Langan (foreground, standing) and Steven Harris-Weiel in Middletown. David Mamet's award-winning masterpiece Glengarry Glen Ross was presented by Bozeman Actors Theatre on September 25th through October 4th, 2015 at The Ellen Theatre in downtown Bozeman. Winner of the 1984 Pulitzer Prize for drama, Glengarry Glen Ross is a biting, fast paced comedy-drama about small-time, cutthroat real estate salesmen trying to grind out a living as they scramble for their share of the American Dream. A celebrated 1993 film version starred Jack Lemmon and Al Pacino, and the play has enjoyed two Broadway revivals within the past decade. Glengarry Glen Ross is a gift to actors, and Bozeman Actors Theatre provided an exceptional group of performers. Directed by Cara Wilder, the ensemble featured Gordon Carpenter, Richard Dunbar, Daniel Erickson, Colter Langan, Tom Morris, Mark Richard and Francis Wendt. Bozeman Actors Theatre presented a one-night-only staged reading of Sarah Ruhl's Dead Man's Cell Phone at Verge Theater on Sunday, July 19, 2015. This captivating comedy-drama explores the paradox of technology's ability to both unite and isolate people. It has garnered kudos from audiences and critics alike, as well as receiving the Helen Hays Award for Outstanding New Play in 2008. Directed by Dee Dee Van Zyl, the cast included Tonya Andrews, Daniel Erickson, Susan Miller, Paul Prescott, Rhonda Smith and Cara Wilder. This first staged reading of 2015 by Bozeman Actors Theare was very well received by an engaged audience. Bozeman Actors Theatre and Verge Theater (formerly Equinox Theatre) team up for a co-production of Christopher Durang’s masterful comedy Vanya and Sonia and Masha and Spike, winner of the 2013 Tony Award for Best Play. Durang’s comedy turns Chekov inside out with siblings Vanya and Sonia living quietly in their family home, passing the time with regret and the occasional outburst from a zany prophesying housekeeper, Cassandra. A surprise visit from their sister Masha, a flamboyant movie star with her young boy toy Spike along for the ride, sets off a hilarious weekend. Directed by Gordon Carpenter, the cast features Dee Dee Van Zyl, Colter Langan, Rhonda Smith, Kari Doll, Libby Gillhespy and Mark Bond. The company launches its new name, Bozeman Actors Theatre, with a production of Julia Cho’s The Language Archive. Co-produced with MSU’s School of Film and Photography, the play is directed by Will Dickerson and features Dee Dee Van Zyl, Cara Wilder, Dan Erickson, Tom Morris, and Claire McGinty. Called “…a quirky, but ravishingly well-written piece that is smart, funny, deep and tender” (OC Weekly), The Language Archive tells the story of a linguist consumed with preserving and documenting the dying languages of far-flung cultures. Closer to home, though, his own language fails him in his attempts at communicating with those closest to him. At turns whimsical and poignant, the play explores the fragile nature of the language of love. One of the most bracing and critically acclaimed plays in recent Broadway history, August Osage County won the Pulitzer Prize for Drama in 2008, followed by the Tony Award for Best Play. The New York Times called it, “Fiercely funny and bitingly sad…” while Time Out New York hailed it as, “A tremendous achievement in American playwriting…” Under the direction of Will Dickerson, ATM’s production brings together professional talent from theatre companies across the valley, including Rhonda Smith, Tom Morris, Kent Davis, Tim Williams, Gabe Clark, Dee Dee Van Zyl, Cara Wilder, Susan Dickerson, Daniel Erickson, Colter Langan, Heidi Krutchkoff, Peri Bauerle and Olivia Langan. Actors Theatre of Montana presented August: Osage County by Tracy Letts and directed by Will Dickerson at the Ellen Theater from August 23-31, 2013. A collaboration between ATM and Equinox Theatre Company, Dee Dee Van Zyl directed Yazmina Reza’s edgy, Tony Award-winning comedy, God of Carnage. Kent Davis, Will Dickerson, Erin Roberg and Cara Wilder are featured in this production as two couples who meet to have a civil discussion about a playground fight between their sons. The conversation quickly degrades into a laugh-out-loud, train wreck of an afternoon among savages, where allegiances shift, realign and disintegrate, in what the Chicago Tribune called a “savvy and deliciously caustic new comedy”. ATM presents Margot Kidder in a staged reading of Well, by Lisa Kron. Directed by Dee Dee Van Zyl, Well also features Cara Wilder and Susan Dickerson, Marc Beaudin, Chris McIntyre and Paige Taylor. A scathingly funny and brutally honest play about mothers and daughters, wellness, illness and reconciling the past with the present, Well is presented for two performances only, at MSU’s Black Box Theatre and at Livingston’s Dulcie Theatre. ATM and the Ellen Theatre are co-producers of Tennessee Williams’ classic, A Streetcar Named Desire. Considered one of the finest American plays of all time, the production is directed by Dee Dee Van Zyl, and features Cara Wilder, Mark Kuntz, Susan Dickerson, Eric Concord, Colter Langan, Ben Trotter, Daniel Potts, Kim Lentz and Sherman Hall.